After a long and full life, Helen Gray (née Rodd) died in her sleep at home as she’d hoped. Helen was dynamic, curious and kind, and fully committed to life and all it offered. A graduate of the University of Toronto and later Tufts University (international law), she chose to marry the love of her life Ian and postpone a career. Once her three boys were in school she went back to school herself, getting a degree in library science at UBC. 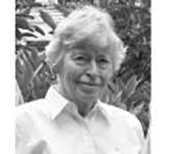 She was among the first librarians at SFU and spent 20 happy years there. She and Ian travelled the world, and enjoyed many friends and evenings at the theatre and symphony. She loved learning and reading, and in retirement was an active participant in Elder College. Helen leaves behind her three sons David (Claudia), Cameron (Peg) and Michael (Sue), along with eight grandchildren (Max, Emma, Andrew, Paula, Sara, Lisa, Christina and Leslie) and nine great‑grandchildren (Jarod, Jacob, Emma, Jasper, Simon, Isaac, Callum, Emily and Isla). We thank Living Well and their caregivers for their wonderful support. We will miss Helen but will never forget her.